Pirate’s Booty, a company known for its all natural snacks, has collaborated with Walt Disney Pictures and Jerry Bruckheimer Films’ Pirate’s of the Caribbean: On Stranger Tides to create a delicious new snack for fans of their products and the Pirates franchise. The brand-new, limited edition Pirates of the Caribbean: On Stranger Tides 7 oz. snack bag is offered in their most popular flavor – Aged White Cheddar – and Pirate Brands will donate $0.05 of each package sold (up to $100,000) through July 31, 2011, to the Boys and Girls Clubs of America. We are excited to collaborate with this summer’s most anticipated movie, Disney’s Pirates of the Caribbean: On Stranger Tides. Disney’s Pirates of the Caribbean and Pirate’s Booty both epitomize the fun, adventurous and humorous spirit that we all love. Pirate’s Booty is proud to be able to bring this to life by giving consumers a chance to embark on a fun, delicious and healthier adventure with the release of its limited edition 7oz. package. Additionally, Pirate’s Booty is offering a chance to win a “Fountain of Youth” themed Caribbean vacation to one lucky winner. Visit piratesbooty.com for more information and a chance to win. 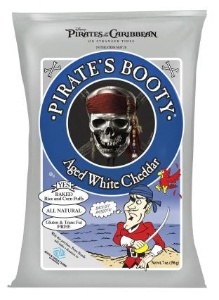 Pirate’s Booty is an all-natural, gluten-free snack made of puffed rice, corn, and white cheddar cheese. The snack is transfat free and contains 130 calories per one-ounce serving.